Kasutajat ei leitud või leiti rohkem kui 1! Palun sisesta ka organisatsiooni nr. TD Baltic has 125 vendors, over 2’000 customers and 70 employees across all three Baltic countries. Year 2018 turnover – 77,5 million EUR. Established in 1993 in Tallinn as a sales representative for Computer 2000. In 2004, Tech Data Baltic entities were sold to the Group’s management during MBO, financed by the Swedish Askembla Growth Fund. Since 2005, core operations are managed from Vilnius. Product offering covers all IT-related product categories. Key products include notebooks, personal computers, servers, networking, software and other products. Revenues from sale of notebooks, servers and PC’s make up more than 50% of total revenues. TD Baltic is engaged in the import, marketing and wholesale of the products of 50 global producers. To utilize the working platform better and to serve the needs of the resellers, TD Baltic also mediates small home/kitchen appliances and audio/video products. Company has 125 vendors in the portfolio. ACRONIS, ADEO, ADOBE, AEG, AFFINITY, ALCATEL, ALLENZI, AOC, APC, APPLE, ARMOR, AUTODESK, AVTEK, BALLU, BEAM, BEKO, BENQ, BERK, BITDEFENDER, BLACKBERRY, BOSCH, BRAUN, BUFFALO, CABLES, CANDY, CANON, CHIEF, CISCO, COREL, CORSAIR, CTOUCH, DELL, DELL EMC, DELONGHI, EATON, ECG, ECODESCALER, EDBAK, ELECTROLUX, ELGATO, ELIBLOC, ELICA, ELO, TOUCHSYSTEMS, ENFOCUS, EPSON, ESET, EUGRC, FABER, FOXIT, FUJITSU, G3FERRARI, GBC, GOOGLE, GORENJE, GRAEF, HOOVER, HOTPOINT-ARISTON, HP, HPE, HTC, HUAWEI, IADEA Corporation, IBM, IIYAMA, IMATION, INDESIT, IROBOT, IRONCAD, JURA, JVC, KENWOOD, KINGSOFT, KONICA MINOLTA, Kramer, LEITZ, LENOVO, LG, LIEBHERR, LIGOWAVE, LOGITECH, MAGIX, MICROSOFT, MICROWORLD TECHNOLOGIES, ML Novator OÜ, MOTOROLA, NAVORI, NEWSTAR, NITRO PDF, NIVONA, NOBO, NOKIA, OMNIKEY, ONEPLUS, OPTICUM, PATRIOT, PELITT, PHILIPS, PINNACLE, PLANET, PLUSS-ID, PROGECAD, RAZER, RICOH, SAMSUNG, SEQRITE, SHARP, SIGNAGELIVE, SINGER, SOFTMAKER, SONY, STEELSERIES, STOLLAR, SiteKiosk, SteelSeries, TABLET, TARGUS, TDK, TEAMVIEWER, TRENDNET, TREVI, VIEWSONIC, WHIRLPOOL, WIN RAR, XEROX, XIAOMI, ZYXEL. For transportation services, (DPD) third party service providers are used. Goods shipped from central warehouse to Latvia and Estonia once a day, ant to Lithuanian cities twice a day. - All larger deals (including tenders) handled by the account managers only. 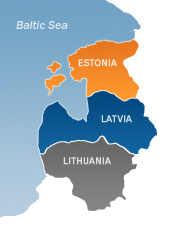 Strong client relationships established during the past 24 years of doing business in Estonia, Latvia and Lithuania. Centralized warehouse in Lithuania with daily shipments across the Baltics. Minimizing cost by outsourcing transportation services to a third party service provider. Credit extension services to their best clients. Efficient logistics services - distribution of products to the required places. Strong portfolio of brands such as HP, HPE, Dell EMC, Cisco and Philips. Established long-term relationships and co-operation with major global brands. The IT market, which has contracted multiple times over the recession, now is recovering strongly. Experienced, highly qualified and certified IT professionals providing pre-sales services to the clients.